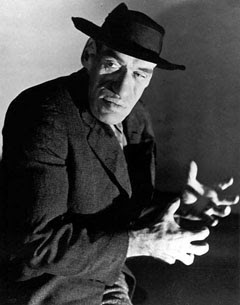 Rondo Hatton was the star of several b-movies from the thirties and forties. He was known for his great stature and disfigured face, however things weren't always like that for him. Originally he was quite handsome and had a developing career in sports-journalism, but then he was sent to France to fight in World War One. Exposure to mustard gas not only severely damaged his lungs but also wreaked havoc on his pituitary gland. After returning, Rondo noticed that he was growing taller and his face was elongating. He was eventually diagnosed with acromegaly, a variety of gigantism. Struggling with his career in reporting, he was discovered by a Hollywood director and, after some coaxing, headed to California to become a movie star. Producers were eager to get Hatton to play villains as his fearsome looks allowed them to cut costs on make-up effects. Gradually Hatton began playing a standard stock character, called "The Creeper," for which he (clad in a black cloak and fedora) would skulk about the in shadows and commit murder until his inevitable slaying by the police. His movie career was pretty prolific given the quick, cheap nature of the movies he appeared in, and he landed roles in twenty-seven films over the following years. Unfortunately his performances were usually left uncredited. In 1946, Hatton died of a heart-attack brought on by his progressively worsening acromegaly. His strange appearance has gone on to become sort've iconic in circles of b-movie enthusiasts and in recent years the Rondo Hatton Classic Horror Award was named in this honor, given yearly to horror movies of outstanding merit and other horror-themed works.